There are many cake lovers, makers, bakers and even eaters in the growing community of sweets, each with his own style and technique. I find it more than enriching to interact and meet those talented artists, perhaps grow a small community of "cakers", so appropriately called. That's why I'm happy to meet Eftychia, she sweetly (no pun intended) agreed to do a post swap. Her initial guest post on my site was a unique take on the art of mosaic pieces. This was a great start for our hopefully continual cake-ship! Now, I give back what I like to call- Gun and Garden. 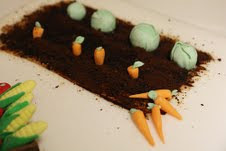 The world of gardening, shooting and those things unfamiliar became just the very opposite when I had to come up with a cake for He who likes both. Yes, my father in-law was having a Birthday and I was making the cake. I wanted to practice my patience and decided to make some gum paste figures. I painted the fence with cocoa powder and water paste. Therest of the details on top were made with gum paste- fondant dough (about 1part fondant to 2 parts gum paste). The garden soil is coffee grounds with aslab of brown painted underneath to make sure it is solid brown. Oh my goodness, the little veggies are fantastic :) This is an ace cake! WOW! This is absolutely gorgeous! I am continually amazed and the cakes I have seen decorated on your blog. Its fun to see these guest posts too. Thanks so much for sharing! Thanks for sharing. The cake is so cute! I love this cake! It is adorable! You're very creative, this cake is sooo.... cute. This is a wonderful cake. 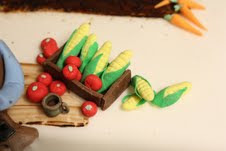 Lots of attention to detail-especially all those little veggies. Cool theme as well. Thanks Efty for having Michal, she is talented. Hope you both had a great weekend! Incredible talent and how creative! That cake is so cute! I love the mini veggies and fruits!